Axeon optics is a newer company with some interesting optic products, but they also make normal scopes. They sent me one of their 4-12x40 scopes for review. Axeon is distributed by Umarex USA. I thought this would be great to try on my .17hmr rifle. So off I went to mount it up. I first want to mention that this is a budget scope, so I am comparing it to other budget scopes that I have used. The Axeon has the old standby Plex reticle. I personally think plex style reticles are fine, but I prefer some sort of ranging reticle. 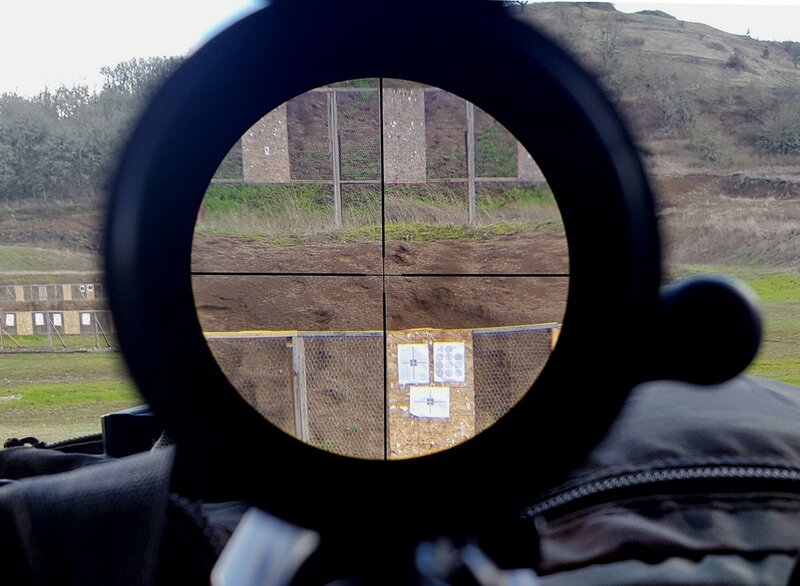 The reticle is in the second focal plane, so it stays the same visual size throughout the magnification spectrum. As stated, this is a variable 4-12 power scope with a 40mm objective lens. It also uses a 1” main tube. It does not have a fast focus eyepiece. I tend to set the focus and leave it alone anyhow. The Axeon scope does have some decent features. It comes with fully coated “green” optics. The green is the actual color of the coatings. The coating seemed to give really good light transmission through the scope, even at 12 power. Clarity was nice and sharp also. So much so that I could see the little 17 caliber holes at 100yds. Axeon also throws in a set of flip covers, and they aren’t so bad that you want to toss them away. The magnification adjustment knob is also really smooth. This makes it really nice to switch magnification while looking through the scope. For windage and elevation adjustments, Axeon uses capped turrets. The caps screw on and off easily. Underneath the caps are the actual ¼ MOA adjustment knobs. The knobs are plastic, but have a decent grip to them, this made turning the knob easy. Now for the really bad part. The click adjustments are terrible. They can barely be felt. So much so that I couldn’t really tell if I went one click or four. Even with this, the scope held it’s zero every time I used it. The rest of the specifications are down below, so I won’t bore you with them here. If you are in the market for a budget scope, go at least look at Axeon. If the adjustments were better, it would be a good little scope. It has some decent features. it just needs a little refinement. What other aesthetic options or finishes are available?